What if treating all products the same in your supply chain ultimately costs you money and diminishes your service level? What if buying products at the lowest cost actually hurts your profitability? As a retailer, your primary objective is to achieve the desired (highest) customer service level at the lowest cost. You must know the tipping point between purchase price, quantity ordered and downstream supply chain costs that delivers the desired service level and maximizes profitability. Retailers must know the tipping point between purchase price, quantity ordered and downstream supply chain costs that delivers the desired service level and maximizes profitability. Many of the world’s leading retailers have dramatically increased their profitability by designing the optimal supply chain. They use modeling technology to examine how their supply chain will perform under a wide range of market conditions and assumptions, and analyze the trade-offs between cost, service and risk. Retailers that maintain these living digital models of their end-to-end supply chain have the ability to redesign and re-optimize their supply chains under changing market conditions, and can test the sensitivity of their key assumptions. A supply chain design initiative can identify as much as 10-20 percent cost savings in the corporate supply chain while maintaining, or even significantly improving, customer service levels. 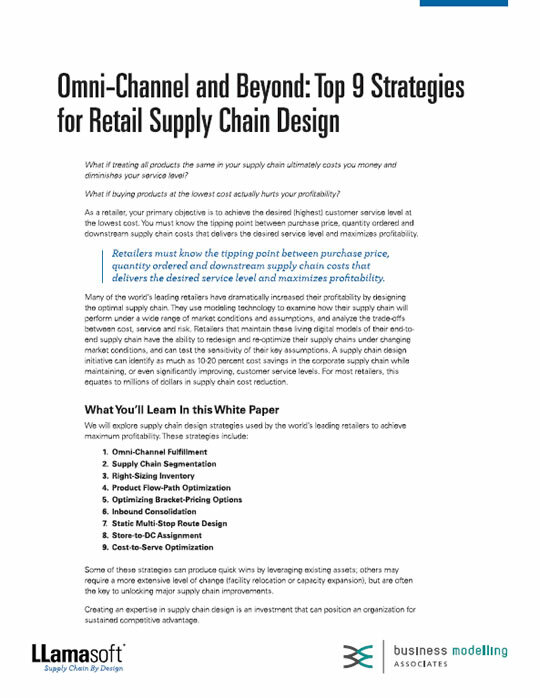 For most retailers, this equates to millions of dollars in supply chain cost reduction.